"Might as well face it you're addicted to love." The lyrics of the classic song reverberated through the St. Regis hotel in New York City on Wednesday night, but we're pretty sure the real addiction is to Georgina Chapman and Keren Craig's aviary-inspired spring Marchesa collection. Debuting a footwear collection and costume jewelry line along with their spring designs, the women behind Marchesa delivered the complete fairytale look with every piece that stepped down the runway. Feathers adorned almost every gown, which played into the "botanical menagerie of caged birds and cascading florals" theme the designers described. For a name that is synonymous with elegance and luxury Marchesa's shoes were no different. "We were able to apply the same process," Chapman said of their new venture, "Using the same intricacies that we would put into a dress, the same level of detail, and that's really what we're most proud of." "We were really thinking about the different kinds of fabrications," Craig agreed, "the different skins, the laser cutting which I think is quite quintessentially Marchesa, and we have a lot of beaded shoes as well." When asked if they could possibly choose a favorite from the glamorous line, they laughed, with Craig saying, "We just had to put in our personal order, and it was very difficult because we wanted them all!" 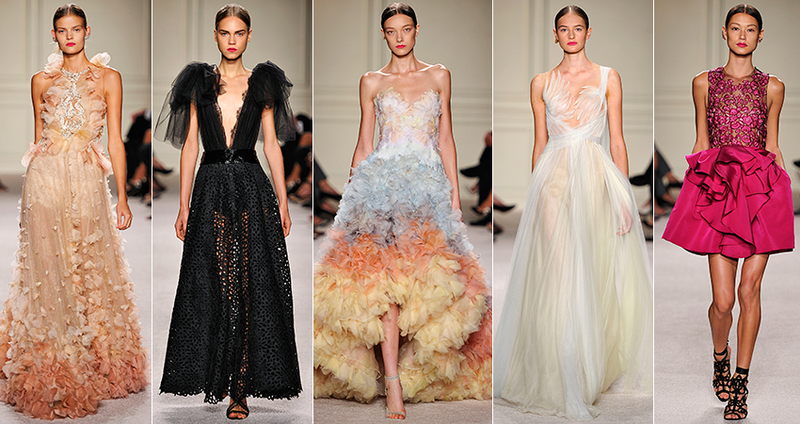 To us, a truly incredible collection is one that looks to every little detail, and that is exactly what Marchesa did. "We had a lot of fun this year between the shoes [and] the jewelry, we feel like we've got the whole look," Chapman explained. They indeed had the whole look, and what a look it was. Hats off to Marchesa, making the world a more beautiful place one piece at a time. Designers Keren Craig and Georgina Chapman greet the audience following the Marchesa Spring 2016 collection.